Kerry Ann Rockquemore, president and CEO of the National Center for Faculty Development and Diversity, delivered the Commencement Address. 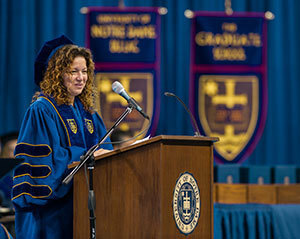 Rockquemore, who received her Ph.D. from Notre Dame’s Department of Sociology, was also recognized as the recipient of the Graduate School’s Distinguished Alumna Award during the event. The top graduating doctoral students in the humanities, social sciences, science, and engineering were honored with the Eli J. and Helen Shaheen Graduate School Awards. In the humanities, Albertus Horsting, a theology Ph.D., was the recipient. Combining the talents and skills of a superb classicist and an insightful theologian, he has made original discoveries about an important fifth-century work by Prosper of Aquitaine—a contemporary of St. Augustine who became one of his biggest promoters and defenders. Horsting, a 2011 Rome Prize recipient, is currently a college fellow in Late and Medieval Latin in the Department of Classics at Harvard University.